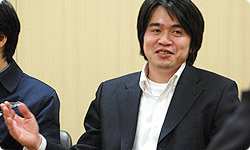 In this interview Mr. Iwata talks to members of Hatena Co., Ltd, with whom Nintendo has formed a joint partnership where they collaboratively operate services that support the Nintendo DSiWare "Flipnote Studio", as well as Nintendo's internal developers. This interview was first published in Japanese in December 2008. We're pleased to be here today. Kondo-san, would you please introduce yourself? Sure. I'm Junya Kondo from Hatena Co., Ltd1 Thank you very much for inviting me here today. We run an Internet website called Hatena. It started up in 2001, and for seven years now we have offered a variety of services, mainly within Japan, such as a blog service, photo album service, and bookmarking service. We recently cooperated with Nintendo in an extremely interesting experiment to offer a service such as has never existed before. 1 Hatena Co., Ltd: An Internet company developing such services as Jinriki Kensaku Hatena and Hatena Diary. It was founded in 2001 and is based in Kyoto. Kondo-san, what do you think about Nintendo? 2 Hatena Bookmark: A new-generation service that allows users to manage their favourite websites online, see what sites others are using, and search for information on the web. Whoa! (laughs) A fastball right at the start! For a while I wanted to develop a business overseas. I was in Silicon Valley for two years. But saying you're going to develop something globally is one thing - actually doing it is considerably more difficult. Around the time I was coming to realise that, the Nintendo DS and Wii console were released. The welcome for those systems at the time, especially for Wii in America, was incredible. So, you felt the excitement back then. I think that excitement continues today. I was moved to see something created by a Japanese corporation set the world abuzz like that. Ever since then I've longed for us to do something to get people all over the world excited. I've held it inside as a sort of goal. I realised that it was possible to develop something globally from within Japan - like Nintendo had - and returned to Kyoto in the spring of 2008. Originally, Nintendo wasn't focused on the world. In Kyoto we were making what we ourselves thought was fun, and Japan received it favourably. Then we gradually spread out into the wider world. As many of the creative ideas and works were born and developed in Kyoto, you might say that Nintendo has been delivering creativity born in Kyoto into the world. That's why I thought this was an excellent opportunity for us to work together. How about you, Ninomiya-san? What were you doing at Hatena before this project? A lot of engineers work at Hatena, but I was originally a designer, and about a year and a half ago I joined Hatena as a director. Since then I've been setting up the miniblog service Hatena Haiku, the photo-sharing service Hatena Fotolife, and the dictionary service Hatena Keyword, as well as giving direction regarding the interface when we opened and renewed the sites. How did you end up working on this project? At the very start, it was Kondo-san and I who visited Nintendo and heard about the project, so it was only natural that I be involved. Ninomiya-san is our "fun-stuff specialist." We set up in a room near the office with a designer and programmer for one of our usual brainstorming sessions and started thinking right away. Now, I'd like to ask some questions to a couple of people who made something a little different that eventually involved Hatena. Could you introduce yourselves and talk a little about this project? 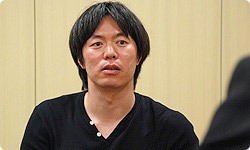 I'm Hideaki Shimizu, also from the Tokyo office. 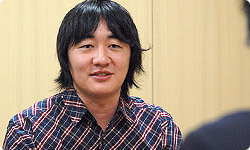 He was in charge of designing Mario's actions in Super Mario Galaxy. And also for Donkey Kong in Donkey Kong Jungle Beat. When it comes to the player character's movements, he's very particular. After development of Mario Galaxy ended in the latter half of 2007, we wanted a unique team for the next project. So, in addition to our other projects, Shimizu-san and I decided to form our own team. And that led to the Flipnote Studio software for use on the Nintendo DSi. The Flipnote Studio Nintendo DSiWare can be downloaded for free. It's a notepad for fun that allows anyone to easily create flick book animation. Actually, you'll be able to enjoy its creations on more than just your Nintendo DSi. We have plans to establish a bulletin board-like website that will allow users to post their creations for others to see on the Internet. We've asked Hatena to operate that site, called Ugomemo Hatena (Flipnote Hatena). This project began as a sort of afterschool activity for Shimizu-san and me.